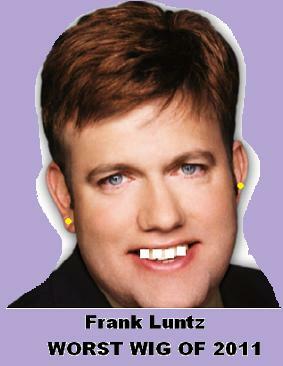 Frank Luntz Wins Worst Toupee, Wig, Hairpiece Of The Year! Home → Across America → Frank Luntz Wins Worst Toupee, Wig, Hairpiece Of The Year! ” He should be issued a ticket for the wig he wore to the Republican debate in Iowa last night. That looked like a head on collision between “Family Guy’s” Peter Griffith and Elton John.”” Benjamin Switchy – Wig Analysis of The World Co.
Republican strategist and pollster and Fox News contributor, Frank Luntz, is beaming today — or at least his hair is, because the Wig Analysis Of The World Co – (WATW) – has voted his toupee and overall look to be the worst of the year. Luntz has gradually gone from an outrageously huge, billowing red wig to a more gentle and understated wig in the past few months, but the change in style and his blubbery facial weight gain has only added to the awfulness of his wig. The WATW doesn’t just throw it’s yearly award at anyone. You have to have a really bad wig to win this and this year, and probably for many years to come, Luntz will bring home the Grand Prize. “The wig is an atrocious auburn-red color,” said colorist and wig expert, Matilda Felds. His wig is so bad that it should have been left out of the voting. Many of us experts feel that the hairpiece he uses falls under the category of pranks and Halloween fun props. Ms. Felds has had harsh words before for Luntz, but these were by far the harshest. Benjamin Switchy, the President of the Wig Analysis Of The World Corporation tries to take a kinder and gentler approach when confronting bad wig wearers despite the fact that his company is the one that gives out the award. “I feel that really bad toupees have a place in society and they serve a greater purpose of making the good toupees of the world look even better. “I am an extreme right wing Republican but yet where toupees are concerned I am impartial. In the past I have given the award to men such as Charlton Heston, John Wayne and several other right-leaning public figures. I do not let my political opinions sway me away from giving the award to a fellow Republican. Peter Luntz is a man in the public eye and TheDamienZone thinks that perhaps his hair is being sabotaged by a Democrat hair dresser — and aren’t all hairdressers in NY Democrats? We asked his stylist. “I do Frank Luntz’s hair and I do the best job I can do, honey.” said Gerald “Power Bottom” Gustinano, who runs “Power Bottom Wigs, Toupees and Extensions Emporium on East 14th Street. “I don’t sabotage him because he is a Republican. I sabotage him because he’s gonna look bad no matter what I do so why not make him outrageous and fabulous? Frank’s toupee had stiff competition from Ralp Macchio this year — and that was one horrible toupee, but Ralph is a little nicer looking so they let him slide.